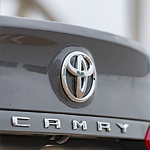 This Toyota sedan is unlikely to cross into another lane on the highway thanks to several innovative features. The Lane Departure Alert determines if the car's wheels are moving between the markings of a single lane. You'll get some leverage from the Steering Assist when the wheels roll within the boundaries of multiple lanes.